We offer the best AMSOIL By-pass filtration advice but please see all below to help pinpoint what you will need for your application. We are building a new database with parts and full descriptions. We are the king of AMSOIL bypass filter sales. All parts and kits are in stock and we have the quickest turnaround time. Let us box you up a year supply of replacement filters to save you money today! Update: For 2017 many kits have been added. Please review these kits on the following list but call us at 800-579-0580 for the best total should you want to order. We are here to answer your questions!! How would you like to go beyond 25,000 miles on a oil change or simply control the most damaging wear and soot particles? All competing filters use older cellulose/resin technology and expensive replacement canister filters. A NO-GO with your budget. You save money because you are changing your oil less often! You also help reduce America's dependence on foreign oil. With Amsoil Synthetic Oils you use even less. A typical engine with less than 100,000 miles using our Bypass and AMSOIL engine oils should expect at least their oil to last 2-years or up to 50,000 miles which ever comes first when using oil analysis. Excellent for that remote stationary engine or that vehicle you will have to rely on when service time is not an option. Your oil is filtered more effectively and efficiently, thus removing more wear particles and reducing the contaminants that cause damage to your engine. Engine life is extended when oil remains analytically clean. Your engine has more oil available to lubricate, cool and protect your engine, once again extending the life of your engine. More oil reduces TBN reduction and can battle acids from soot and deposits better in older cars and diesels. Removes more small particles and soot contaminants that can cause engine wear and premature damage to your engine. Filters particles less than 1 micron in size and 100% down to 2. You will get more use out of the investment. More on soot below. Reducing the potential harm to our environment and further reducing dependence on foreign oil. This can help you receive better mileage; which of course saves you money! Safely clean-up deposits from an abused or improperly maintained engine in used cars. #1 reason for install as you can halt or reverse the loss of efficiency to any motor as well as reduce blow-by and other problems which occur in older neglected vehicles. Great for vintage vehicles as well. There are a number of copy or knock off "Bypass" kits sold on Ebay or various websites for less money coupled with our spin on bypass oil filters. AMSOIL questions the integrity of the design and whether they will harm the engines they are made for. AMSOIL designs our kits to ensure engine oil flow and pressure is sufficient to the engine all the time and all the while taking a little bit at a time away from the engine for advanced filtration. We are concerned with these kits, however these companies are ultimately liable for any issues they may cause to your engine. Please beware that these copy kits and fittings may fail, crack or warp. AMSOIL's parts are tested and have millions of error free miles. AMSOIL backs every kit protecting you incase of failure. Will the competing company warranty your engine?? I doubt it. 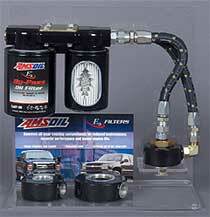 AMSOIL Ea By-Pass Filters remove 39 percent of soot contaminants less than one micron. Soot removal efficiency can increase approximately 10 to 14 percent when Ea By-Pass Filters are used in conjunction with a standard full-flow filter, even higher in conjunction with Ea Filters or Donaldson Endurance filters. The combustion process in diesel engines creates soot. After fuel is injected, combustion occurs, producing soot as a by-product. The combustion particulates then become trapped on the exposed oil film. The rings wipe the particulates into the oil and the fine particulates aggregate, increasing levels of soot in the oil. Oil with dispersant additives will generally keep soot in the range of 0.002 to 0.5 microns in suspension. As the amount of soot suspended in the oil increases, the performance of these additives decreases. As dispersants in the oil are consumed, soot particles grow to a size that causes problems. 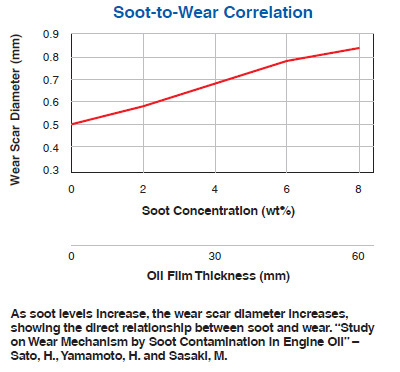 This creates a direct correlation between wear and soot concentration; the higher the concentration of soot, the higher the level of wear (see graph). New BMK-30 kit for heavy duty use - single bypass mount for the larger EABP 120 Bypass oil filter. Call for parts and pricing. This is a LARGE unit for high capacity oil sumps - Class 7, 8 and large generators. Download our data sheet OR See our BMK-30 expanded section here! How to use this page!! We sell a lot of bypass units. Sometimes one per day. but we also get a lot of the same questions so here is the answer. 1. Read over the page to see what kits works best for you. Kit Descriptions start 1/2 way down the page. 2. Review the install & servicing instructions which all are located 3/4 of the way down the page. 3. For pricing it's best to call 800-579-0580 but AMSOIL only allows pricing to be displayed through the main online store but again, this is retail. You must call for best price. To get the best price on the kits, call me OR enter the store and select the preferred customer option. Add that option to the cart then cost pricing will appear. Make note of part numbers. It may be easier and faster to call me so you don't miss a part. 4. Don't be afraid to call late. We are a top dealer because we like to talk to our customers. We operate 9AM to 7PM M-F and when we can Sat & Sun. 5. Most applications you have the choice for the single or dual units. I personally like the single as the full flow is the OEM design (our AMSOIL EAO-Oil filter) and they are generally easier to find a mounting location. 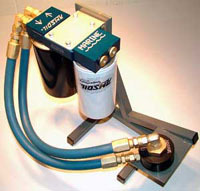 The dual are of the highest quality and are best for installs where the stock filter is in a bad location for service. The dual does deliver 100% of the oil back to the oil galleys. Pricing - This link to the Bypass kits in the online store will show you retail on-line pricing but just by calling 800-579-0580 or joining as a preferred customer instantly saves you 20% or more. New Quality Parts - All the dual kits which use the adapter to remote the factory oil filter have been updated. The photo above shows that improved part in the center display. The bolt on adapter uses a hardened & polished aluminum ring meaning better machine work for better oil flow and longer life. No cracking or leaks. Celebrating 26 years of our Bypass filter line see the latest Ea "Absolute Efficiency" line of bypass filters. Please click here for more information on the spin on units - 100% efficient at 2-microns. Engine wear is caused by dirt particles larger than 5 microns. The updated AMSOIL Bypass Oil Filter is 100% efficient at 2 microns. The updated housings offer greater flow and quality, and better cold temperature filtration. 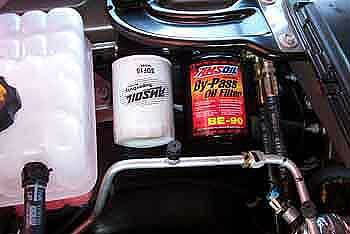 AMSOIL has the best selling bypass (parasitic filtration) kits because of their low cost and ease of use. Makes it easy to eliminate engine wear in all your cars. Other advantages include protection against acid causing soot, carbon, varnish, and other oxidation components. Upgrade your air filter too and enhance your wear reduction strategy! just by getting rid of those "oil wetted gauze" air filters, you significantly decrease engine oil contaminates. Please try the AMSOIL Absolute Efficiency, cold air induction, and racing/street rod air cleaner configurations. See just how effective the By-Pass System is in your vehicle both diesel and gas by watching this recent sales presentation. As a dealer the bypass filter (Partial Flow) is one of the best selling AMSOIL product because it works. AMSOIL's Bypass filters monitored through a oil analysis program have been proven to allow AMSOIL synthetics to maintain proper oil viscosity for extended periods, often beyond 150,000 miles in average gasoline and diesel vehicles. These filter systems save time and money while reducing the potential for used oil contamination in the environment. When using AMSOIL engine oils, generally change Ea Full flow oil filters at 1-year intervals (or 25,000 miles) and the new EaPB every other full flow filter change or 60,000 whichever comes first! An old but great vintage AMSOIL video made by the Tech Services director Dave Anderson. Dave is the father of the bypass filter and other AMSOIL innovations. One of the best guys you will ever meet. This unit is an older filter. The current filters have 2X the capacity thanks to Donaldson's nanofiber. 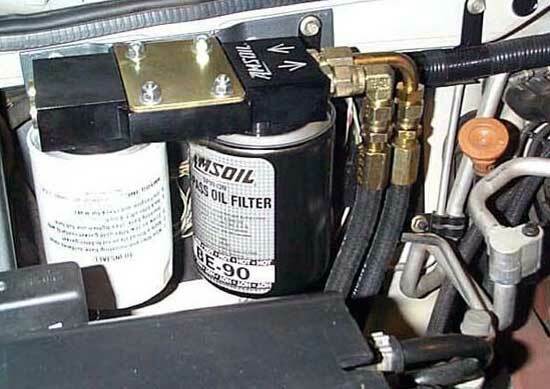 (To just relocate your existing oil filter only - order BMK-14 (more below)) - Simple and low cost. Vehicle applications at bottom of page with illustration links! See Chart. The AMSOIL Bypass filter kits come in several variations. When selecting, please see the chart below or call us directly at 1-800-579-0580. We sell several weekly so we can help you get what you need quickly. I personally prefer the BMK-21 for almost all applications. 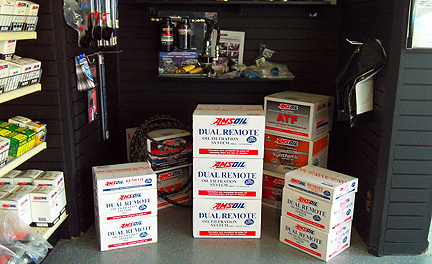 The 23 us the universal dual remote (full flow and partial flow), the 14 is a remote oil filter only and the 25, 26 and 27kits are duel units designed for the main selling diesel pick-ups. For those wanting to add a bypass filter to smaller vehicles with limited space or if you do not want to relocate your current filter, use the BMK-21 (Overview drawing), which is the bypass only. We have many Volkswagen, Toyota, and other compact engine compartment's housing these. Follow this link to read about the latest filter element!! See an actual road test using the AMSOIL Synthetic 5W30 Heavy Duty Diesel Oil and the BMK-22. This was used on a fleet of Kenworths, but the majority of our customers use these on their cars, diesel pick-up trucks and marine use. See some of the install photograph links towards the end of this page. We know the parts you need so call or email for assistance 1-800-579-0580. Don't forget to view the install pictures listed below!! The AMSOIL Bypass Oil Filter provides the best possible filtration protection against wear, oil degradation, rust and corrosion. Working in conjunction with the engine’s full-flow oil filter, the AMSOIL Bypass Filter operates by filtering oil on a "partial-flow" basis. It draws approximately ten percent of the oil at any one time and traps the extremely small, wear-causing contaminants and water that full-flow filters can’t remove. The AMSOIL By-Pass Filter typically filters all the oil in the system several times an hour, so the engine continuously receives analytically clean oil. Useful for fleets and the daily commuter. The key to these kits is to first read the installation instructions. Please download and print the PDF copies found in the sections below. If ordering the BMK-23 Universal Dual Remote (Bypass filter with full flow together) you must order the correct Spin-on Adapter to match the filter thread of your engine. This improvement results in better chemical resistant sealing and easier installation as well as larger hose. See Diagram F in BMK-23 Instructions. Call for price. This is the thread used on that equipment This is the adapter kit you should use. New Kits all come with a Pre-paid oil analysis card for one free used oil analysis. BMK-21, BMK-22 & 30 Kits. SEE BMK-23 Below. It is the dual unit with the adapter. See the rest of the kits (dual) further down. In the photo on the right, the filter dimensions include the distance needed for removal. AMSOIL now offers new by-pass components to ease the installation of the BMK21 By-Pass Filtration System in three popular diesel engines: the Ford 6.0L Power Stroke™, the Dodge 5.9L, 6.7L Cummins and the General Motors 6.6L Duramax. To ease installation of the BMK21 on 2003 and later model Ford pickups equipped with the 6.0L Power Stroke™ diesel engine, AMSOIL provides the new Aluminum Billet Oil Filter Cap (BK1101), the Aluminum Billet Oil Fill Cap (BK1102) and the 90-degree JIC Elbow (BP242). These new high-quality billet aluminum caps replace the original equipment manufacturer (OEM) filter cap and oil fill cap. The new caps have holes tapped in them that accept the JIC elbows for hose connectors. I also suggest the BP-67 petcock valve to take clean oil samples from. To ease installation of the BMK11 in 2004 and later model Dodge pickups equipped with the 5.9L Cummins diesel engine, AMSOIL offers the new 1/8" NPT - 1/4" JIC fitting (BP241), the Aluminum Billet Oil Fill Cap for Dodge 5.9L Cummins diesels (BK1301) and the 90-degree JIC Elbow (BP242). The BP241 fits onto the existing plug on top of the OEM full-flow filter mount, and the addition of the BK1301 eases the installation of the oil return line. To provide GM Duramax owners the same ease of installing the BMK21, AMSOIL is now offering an oil filter “Sandwich” adapter (BK1201). ** For all the BMK-21 installs we think it is wise to order the BP-67 oil sample petcock valve w/ street tee fitting. EaBE-90 Diam. = 4.5 in. EaBE-100 Diam. = 4.5 in. EaBE-110 Diam. = 4.5 in. (2) EaBE-90's Diam. = 5 in. (2) EaBE-100's Diam. = 5 in. (2) EaBE-110's Diam. = 5 in. With Mnt. = 12" 4 qt. 15 to 42 qt. (1) EABP120 Width = 5.35 in. Height = 17.5 in. 4 qt. 15 to 42 qt. Large Trucks, Construction, Farm and Industrial Equipment, (minimum sump capacity = 15 qt. 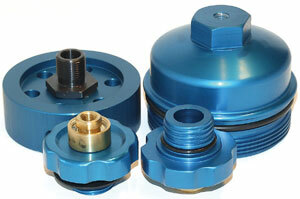 ), the BMK30 kit can be mounted in series for sump capacities greater than 42 quarts. Normal Service Life:When used in conjunction with AMSOIL motor oil and an EaO or Donaldson Endurance filter, the EaBP should be changed every other full flow filter change up to 60,000 miles. When used with other brands of motor oil or full flow filters, the EaBP filter should be changed every other full flow filter change. AMSOIL recommends using oil analysis when extending oil drain intervals. We recommend ordering the BK-13 drain valve for your oil sampling. Order the BP-67 for BMK-21 and BMK-22) You should call us at 800-579-0580 so we can go over any additional parts you may need. Main Instructions - great material to help you decide which kit is best for you. BMK-21 Installation and Servicing Instructions - Single Bypass mount kit which we prefer for most installs. Also for 2004 and later Dodge 5.9 TD. See this DATA Sheet for more information. 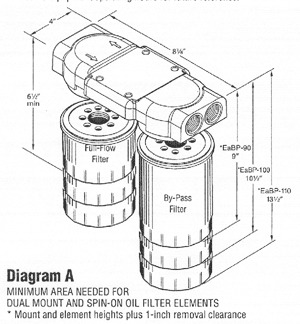 BMK-22 Installation and Servicing Instructions - Dual Bypass Filter Unit. Designed for large capacity systems. New Single Bypass Sandwich adapter for Duramax! Call 1-800-579-0580 for price and parts needed. 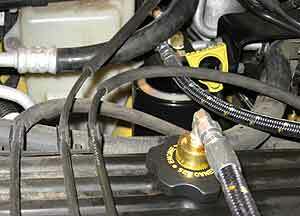 Jeep Cherokee install - BMK-21 and oil return to cap. The Ford 6.0 is one of AMSOIL's #1 customer bases. The HDD 5W30 and our bypass kits solve a number of heat, soot and mileage issues. If you have a Ford 6.0 call us and at least try the HDD 5W30 and Diesel fuel additive then consider our Bypass get up. 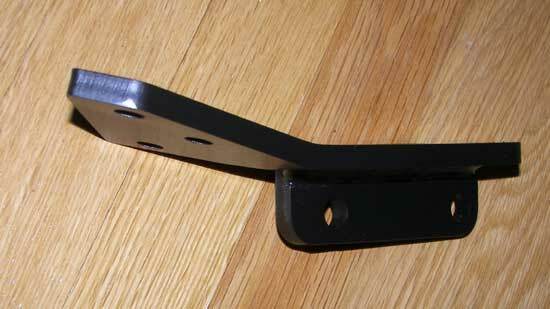 This bracket we sell makes adding a bypass kit to the 6.0 FORD Powerstroke the easiest one! BMW 325I Single install - Easy use of space! 1981 BMW 528i - New (2012) install - great work and custom bracket. 1994 Dodge Caravan Single Bypass. 2004 Chevrolet Impala LS 3.8L V6 BMK-13 install - Excellent project! This By-Pass was installed without drilling any holes and no additional custom bracket or adapters. Excellent and simple install. 2001 Chevy Cavalier 2.2L I4 - Neat compact installation making a excellent car even more reliable while simplifying oil changes for the family. 2002 Jeep Wrangler 6-Cyl. - One of our most popular vehicles to add the By-Pass system to. I also added a Jeep Cherokee which I did the install on. 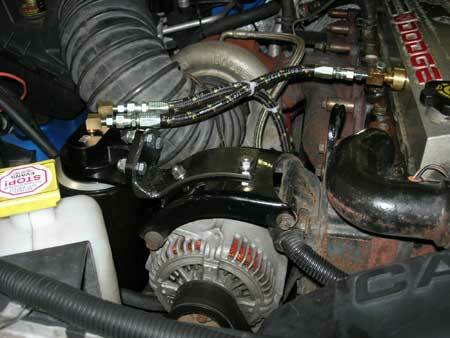 See how the filter (BMK-13) was installed in Dealer -Fred Hubert's Tundra! 1988 Olds Cutlass uses BMK-11 - Simple and low cost protection!!! Designed for heavy duty work-horse engines that have oil sumps from 16 to 42 quarts. 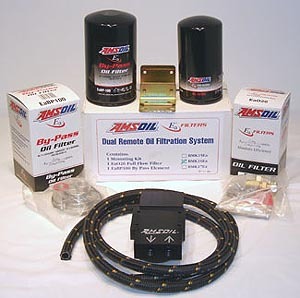 This kit is uses two AMSOIL Bypass Filters (three sizes to choose from). Their unique internal flow spreader and follower spring system provide a non-channeling filter media system. Each Bypass unit contains stacked-disc type elements which has been shown to reduce piston ring and rod/main bearing wear 75% to 91% (Society of Automotive Engineers paper 881826). Note: If you are interested in the BMK-22 - you may want to consider our BMK-30 which is a new kit designed to make installation easier and for the same results using a single large bypass filter. Take a look at the BMK-30 Spec sheet for a brief overview. The BMK-30 is basically a modernized version of the BMK-22. It's Convenient: Elements spin on and off for fast, neat filter changes. Built-In Safety: A metering orifice inside the mount controls the oil flow so that it never draws more than 10% of the oil pump's capacity. At an engine speed of 45 mph, the AMSOIL Dual-Guard Bypass Filter cleans all of the oil in the system every 5 - 10 minutes (depending on engine RPM, sump size, and oil pump ratio). The BMK-22 Mounting Kit: The BMK-22 kit contains a mount, mounting hardware, a restriction fitting, and two 3/4"-16 to 1/4" JIC fittings (Please see link above with parts list). Complete installation instructions are included, along with an additional parts list of plumbing hose and fittings available separately from us or your Commercial account. Spin-On filter elements should be bought separately in pairs based on sump size or available space in the engine compartment. The following is merely a overview, since the larger the element used, the less frequently it will have to be changed. See actual intervals as tested in these performance tests. For a crankcase sump of 15 to 18 quarts, use two (2) BE-90 filter elements. For a crankcase sump of 15 to 30 quarts, use two (2) BE-100 filter elements. For a crankcase sump of 15 to 42 quarts, use two (2) BE-110 filter elements. Your AMSOIL By-Pass Filters will last twice as long as your regular filter, so change them only half as often. The AMSOIL Bypass filter kits are a low cost way to extend engine life, save time, reduce maintenance and protect the environment. BMK-21 recommended to replace all Studebaker factory bypass filter units. As a Studebaker owner I will have some photos and results soon but if you would like to discuss the product we have to upgrade your Studebaker bypass filtration system which is about the most simplest installation possible with these kits, please call me. I would suggest calling to take a current oil sample then after the installation of the kit sample again to see the results of superior bypass filtration.